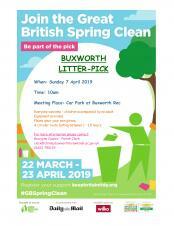 In association with the Great British Spring Clean the parish council are organising a second community litter-pick around Buxworth. Meet at the Car Park at Buxworth Rec at 10am on Sunday 7 April 2019. Everyone welcome - children must be accompanied by an adult please. A circular route, approximately 2 miles long, taking 1 - 1.5 hours. Please wear your own gloves. All other equipment provided.